Many, many years ago I spend a season guiding. I only guided that one season as life kind of happened in the off-seasons and by the next Spring I had a steady job I was interested in and that was that. I enjoyed guiding, although I was still learning and I certainly took more away from the experience than others likely got from me. In any job you have a learning curve and I was still on that curve when my career took a different direction. Still, there were a couple of really awesome moments in my short time guiding. I was reading The Alaska Chronicles (by Miles Nolte) last night (yeah, I’m late to this party, but I’m enjoying the book), and it got me thinking about the successes and failures in my own guiding. One story comes to mind and here it is. A lot of people might have heard of Hat Creek. It is a Spring Creek in a land of Free Stones. It is located in the North East part of California, about an hour from Redding and about an hour from Lassen National Park. It meanders through a landscape that sees forest and something akin to plains, almost like the landscape around the Madison in Montana, just a bit smaller in scale. Hat Creek, like a lot of the rivers in California, is interrupted by power houses. It has been significantly altered to suit human demands. The section of Hat Creek that most people think of is below Power House 2 where the river emerges from the power house, makes a 90 degree turn and goes over a riffle that might be 30 yards long before taking on the smooth, even, slick and difficult flat water section that looks like what you tend to think of as a spring creek. The riffle is a really interesting place, or at least it was back then (about 1999 is when I was guiding there). The fish live in the flat water but cycle in and out of the riffle to feed. It is one of the very few places in California where success does not depend on covering water. You can find a place and stay put. The fish come to you. If you have your weight set right, you just cast out, 15 feet or so, again and again and again and eventually, you catch a trout. 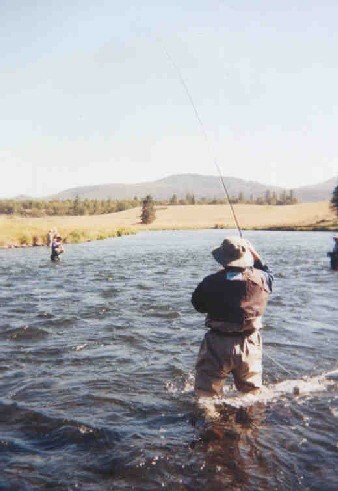 It is also one of the few places in California where 15 people can fly fish on the same piece of water at the same time. You get two rows of people, one on the near side of the riffle, the other on the far side of the riffle. So long as no one goes and walks through the riffle and screws up the circulation of fish, everyone can catch fish. This was a favorite spot for guides from the lodge I worked at. You could get someone dialed in with their indicator casting without worrying about anyone falling in. You could work a group of anglers and have everyone within 30 feet of one another. You could station someone who was maybe a bit older or unsteady and they could stay put and catch fish. You might spend the morning on the Hat and then head off to the Pit or a creek somewhere or maybe even the Lower McCloud. Mid-week, the riffle usually wouldn’t have too many folks on it and since it was about 10-15 minutes from the lodge, it was a frequent stop. As summer wore on you’d start to see a trico hatch and spinner fall on the Hat and that could offer a couple hours of decent dry fly fishing, although with size 20 spinner, a bit hard for some folks to see. The spinner fall was hit or miss. Sometimes it just didn’t seem to happen, others it got going pretty strong (for a CA river, I’ve seen spinner falls other places and ours never seemed to rise to epic levels). One the morning I’m thinking of I had three clients, one more than is generally a good idea, but it was a father, son and the son’s friend. The son and his friend were 13-14, well behaved, good sports. That morning the spinner fall was a bit light and the fish weren’t really grabby. I noticed on the edge of the current there were little fish, I mean, really little fish, throwing themselves at the light spinners with reckless abandon. These three inch troutlets would fling themselves at the #20 spinners, cartwheeling out of the water. While I had the father and son keeping after the sporadic rise, I decided to do something different with the son’s friend. I put him downstream a little bit and changed his #20 trico spinner for a sparse black leach in a #8 or so. I told him to cast out, quartering downstream and let the fly swing into the seam and then I wanted him to slowly twitch the streamer back up stream. It worked. Five minutes after I got the kid sorted out he had a strong pull and was fast to a good fish. I helped him land what turned out to be an 18″ brown trout, which for Hat Creek is both rare (It is about 95% rainbows) and a really good fish. It would have maybe been better if I had the dad or his son land the biggest fish of their trip, but it was such a low percentage shot, I didn’t want to risk it with the guy who was actually paying for the trip. I miss being that connected to a bit of water where I even have hunches about things that might work. You lose that when you become an infrequent visitor instead of a daily visitor. It was a highlight from my year on the water. I had a couple other moments of guiding success, maybe more than a couple, but that life was short lived for me. I hang on to those moments. This entry was posted on Wednesday, April 5th, 2017 at 8:30 am	and is filed under Fish Tails. You can follow any comments to this entry through the RSS 2.0 feed. You can leave a comment, or trackback from your own site.